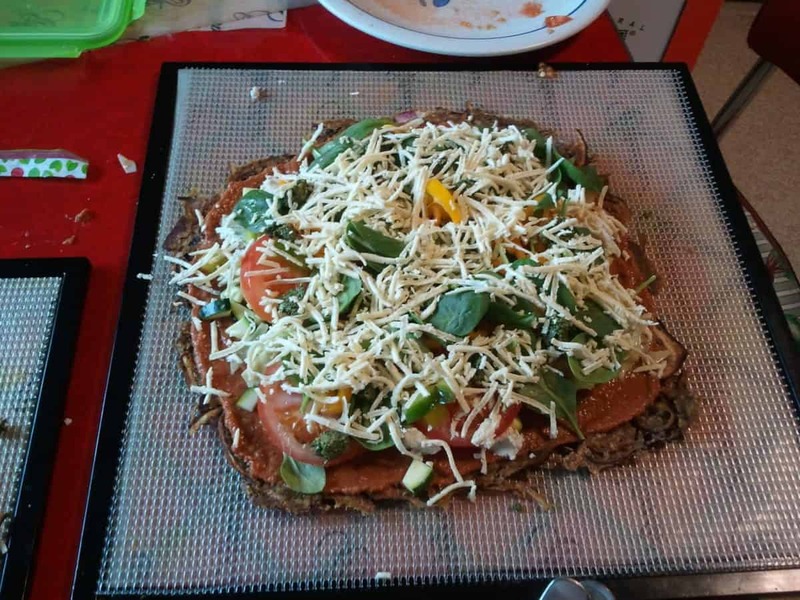 My friend Michael uses this intriguing recipe to make his amazing pizza crust. Cut the onions thicker, and you can have onion rings instead! Use food processor with “S” blade to mix dry ingredients only. Add tamari and olive oil, mix again until creamy. Transfer to a bowl. Slice the onions in thin rings using the food-processor slicer or a knife. Cut onion rings in thirds. Blend them gently by hand into the mixture. Distribute the mixture in the shape of circles on 2 teflex dehydrator sheets. 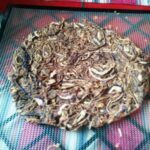 Dry pizza crusts in dehydrator at 105 degrees, 18 to 24 hours. Remove teflex sheets and continue drying for a couple of hours on mesh sheets in the trays. Cut the slices thick, because when they dry they get much thinner. Gently mix batter and rings together. Put rings individually on teflex sheets. Dry onion rings 4-8 hours or until crispy.